I made these bad boys yet again. It’s probably the 20th time. They are simply one of my favorite non-chocolate cupcakes. “Hummingbird cake”, from what I understand, is a southern recipe. I have seen the recipe around. Martha Stewart had it in her magazine. I forget when… I got the recipe I use from the internet. I don’t remember where from as I copied it down a long time ago. Seeing as I can’t find the recipe and all the others I have found have twice the oil, I will go ahead and reprint what I have. 1. Mix flour, sugar, baking soda, cinnamon, salt with a whisk in a good sized bowl. 3. Add oil and vanilla to beaten eggs and mix until somewhat combined. 4. 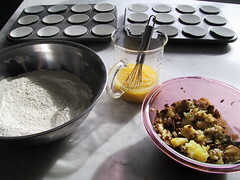 Add egg/oil/vanilla mixture to flour/sugar/baking soda/cinnamon/salt mixture. 5. Mix together pineapple, bananas, pecans until combined. 6. Add to the rest of ingredients and stir to combine. Bake at 350 degrees for ~25 minutes until golden and a cake tester comes out clean. I top these off with the cream cheese frosting recipe from the Buttercup Bakeshop book. Chocky Lit, thanks for the link! Your Hummingbird Cupcakes look tasty. I’ll print out the recipie for one day when I’m feeling ambitious. I use the liquid of the crushed pineapple… No draining. I will update the recipe. Thanks. absolutely fab hummingbird cakes oh great yumminess….in your pic the frosing is two colours did you just colour it ? please can you help with a recipe for brownie cupcakes as my normal brownie mix was just too dry once cooked. Brownie cupcake sounds good. I shall try one soon. I would this weekend, but I want to do one more fruity one while its still summer time and the fruit is good. We do love the cupcakes out here. this looks fantastic…I have the same recipe from a great little book called Cakewalk by Robin Gourley (which I recommend, by the way, if you can get your hands on it)–I’m going to do a side by side taste test. These were yummy! drizzled some caramel on top of the frosting. Also, I used some unbleached parchment cupcake papers that someone gave me. The cakes slipped right out of the papers. Unless you want paperless cupcakes, I would not recommend them. I just though I’d point out that the eggs in this recipe aren’t really necessary due to the banana which acts as a binder. It just made it very vegan friendly. Thank you! 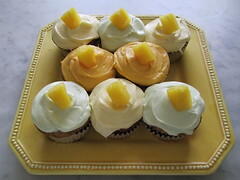 I like to put a little chopped mango and some fresh pineapple bits on top of the cream cheese frosting. When I make this into a 3 layer cake I put the chopped fruit in between each layer as well. Chockylit, thanks for this recipe. My wife loves Hummingbird Cake and I made a batch of these for her birthday recently. She loved them. I am not a nut person and wondered if you thought I could substitute golden raisins for the nuts? Could you, perhaps, post the recipe for the cream cheese frosting? If not, quite alright. I made these last week and they are sooooo good! I used the ‘Thick Cream Cheese Frosting’ from this site and they were fabulous. My husband, who refuse to eat cake, has requested these again very soon. Thanks for this recipe, and I love the website!! Cheryl, you are such an inspiration. I used this recipe as my very first post. They tasted wonderful, only problem that I had was that they were a little dense?? Kinda like a muffin, I wonder if I did something wrong, or if they were supposed to taste like that? My husband and munchkins loved them regardless, so I guess it’s just me… I’m a little hard on my self! I sent this recipe to my dad to make for my birthday, and I must say that they were FABULOUS!!! 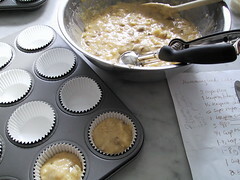 I bet that if you didn’t frost them, you would have really good breakfast muffins, too. Thanks for the great recipe! Hi, I’ve been wanting to start my very own cupcake bakery mini production, and so I have began trying different recipes for both cupcakes and frosting. I tried these Hummingbird cupcakes and they came out more like muffins. Is that about right, cause I was just wondering if I cooked them too long, or what happened? I also had a question about the batter. It was very very dry when I made it, so I splashed in some milk. I’m not sure if that affected the final product or by how much. Thanks so much. Your cupcakes are so beautiful and inspiring! Oh and if you have any suggestions concerning a small cupcake business that’d be great! Could I get the recipe for the cream cheese frosting for the hummingbird cupcakes? I want to make these for my daughters 20th birthday very soon. I love your blog!!!!! Hi Chockylit, your website is fantastic. I would like to try this recipe, but wondering if I can get the recipe for the cream cheese frosting? Thanks. Thanks for the lovely recipes…can’t wait to try some. I am looking for an old chinese recipe (I think it’s chinese) for a boston cream pie the chinese restaurant back home made in the 60’s. It’s not made with the tradittional vanilla custard but was a clear coconut color and was gelatin like. The rest was your typical boston cream pie. The white clear filling was loads better than the vanilla pudding filling. Anyone heard of it? I love love love these cupcakes! This is my go to desert for any crowd and I always get rave reviews from everyone. They are simply phenomenal! Thank you so much for the amazing recipe.